As Nashville grows existing areas are attracting new-found attention. Push past East Nashville and you'll start to see it -- all the new builds. NASHVILLE, Tenn. — As Nashville grows existing areas are attracting new-found attention. Push past East Nashville and you'll start to see it -- all the new builds. It really appeals to people that want to be close to Nashville, close to downtown," said realtor Chris Hulsey with Live the Locals. Hulsey says as Nashville gets more expensive, would-be homeowners are exploring areas a little off the beaten path. He has several properties on Kingston Street off Dickerson Pike. "With growth it takes people that want to pioneer and get out of their comfort zone," he said. 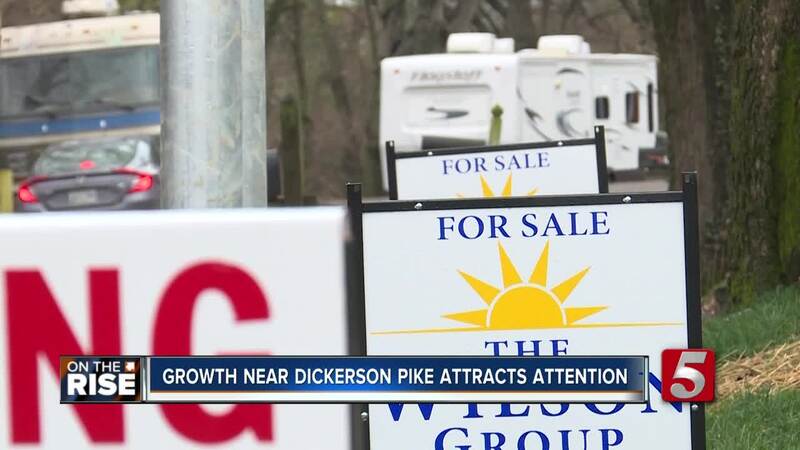 "This [property off Dickerson Pike] gives you the opportunity to get a new build and a reasonable price point and still be able to take advantage of all the growth in all the excitement of downtown and the different neighborhoods," he said. Residential real estate is not the only type of development expanding to areas outside the city. According to Live the Locals, commercial real estate sales volume for 2018 was more than 65 million dollars in retail alone, which is double the historic average along this corridor. Doy Gardner is the owner of Black 13 Tattoo Parlor. He already has a location downtown but wants to expand and says this property off Dickerson is exactly what he was looking for. "With East Nashville in general there's been a lot of growth in the area but Dickerson is still somewhat untouched," he said. Three new developments are planned to begin construction in 2019, which will bring over 550 residential units along Dickerson Pike.